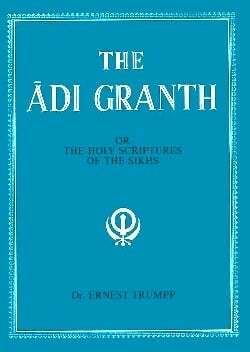 Despite the charges, Trumpp primarily approached the Adi Granth as an orientalist, with obvious biases. His translation is hardly readable but is useful as a reference. The introduction is a travesty reflecting many of his already formed opinions. One should remember, however, that he saved and identified important documents and raised issues. There was some initial negative response to his work, but that cascaded in the 1890s as the Singh Sabhas tried to carry out their own translations with [Max A.] Macauliffe. I am puzzled by Khushwant Singh's critique of the [W. Hew] McLeod collection. The documents McLeod presents and the context that he develops for each set of writings is an important record in understanding what the Chief Khalsa Diwan, the Bhasaur group, and later the authors of the now widely accepted Sikh Rahit Maryada [Sikh code of conduct] had to address in terms of conflicting views and issues.